Rising Star Games brought a remastered cult classic to the Humble Weekly Bundle table. The latest Humble Weekly Bundle offers a pay what you want package for Deadly Premonition: The Director’s Cut, The Marvellous Miss Take and Tulpa. Pay more than the average – $2.74 at time of writing – to also receive Kromaia and Cloudbuilt. Cough up $8 or more and you’ll score TRI: Of Friendship and Madness and early access to Ratz Instagib. You choose how proceeds are split between publisher, organisers and charity. 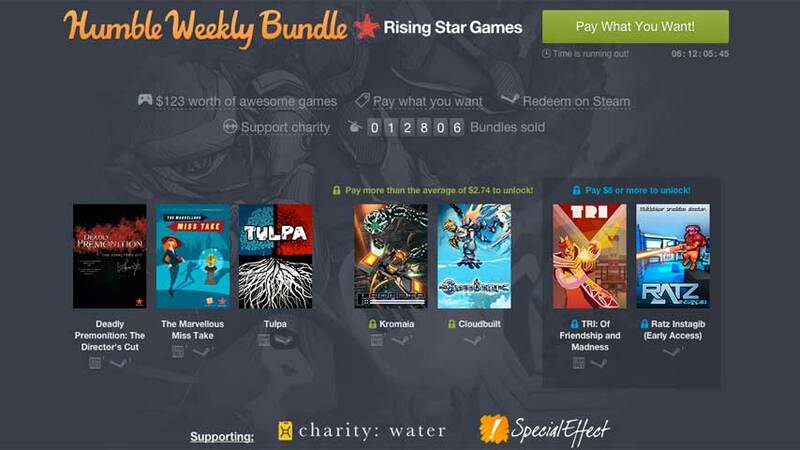 This week, the bundle benefits charity: water and Special Effect. Most of the games are available DRM-free this week, and there are a few Mac and Linux versions. too. Go on, take a look.